So much for that neckline breakout! CAD/JPY can’t seem to sustain its climb so I’m cutting my position for now and waiting for a deeper pullback instead. I had been banking on the hawkish BOC policy bias to keep this pair climbing after breaking past the inverse head and shoulders neckline around the 86.00-87.00 area. Around that time, there were also several factors supporting crude oil as well. However, the yen has been putting up a really good fight in keeping CAD/JPY gains in check, especially after the BOJ refrained from sounding more dovish in their latest policy statement. 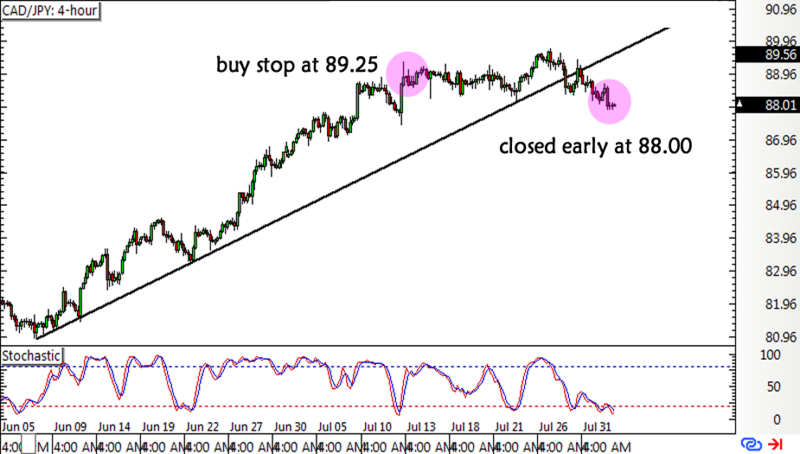 Price came close to testing the next barrier at 90.00 but it looks like a reversal might be underway from here. CAD/JPY just recently broke below a rising trend line connecting the lows since June and a near-term support area around 88.30. Because of that, I just decided to cut my losses for now while staying on the lookout to re-enter at a much better price. I’m keeping a bullish Loonie bias because of the positive developments in the Canadian economy and in the crude oil market, but it looks like the pair is topping out and profit-taking is coming into play for now. I’ll also keep close tabs on the upcoming Canadian jobs report to gauge whether or not the BOC can follow up with another interest rate hike before the end of the year. If the actual figure comes in much weaker than expected, though, I’ll probably have to rethink my bullish CAD bias. How high can the Loonie go? I’m keeping close tabs on this long-term CAD/JPY reversal pattern to see if the Canadian currency can extend its rallies. The Bank of Canada will be making its interest rate statement today, so I’m looking at potential entry levels for this CAD/JPY play. Thanks to the BOC interest rate hike, this pair popped sharply higher and triggered my breakout entry order. Here’s a quick update.